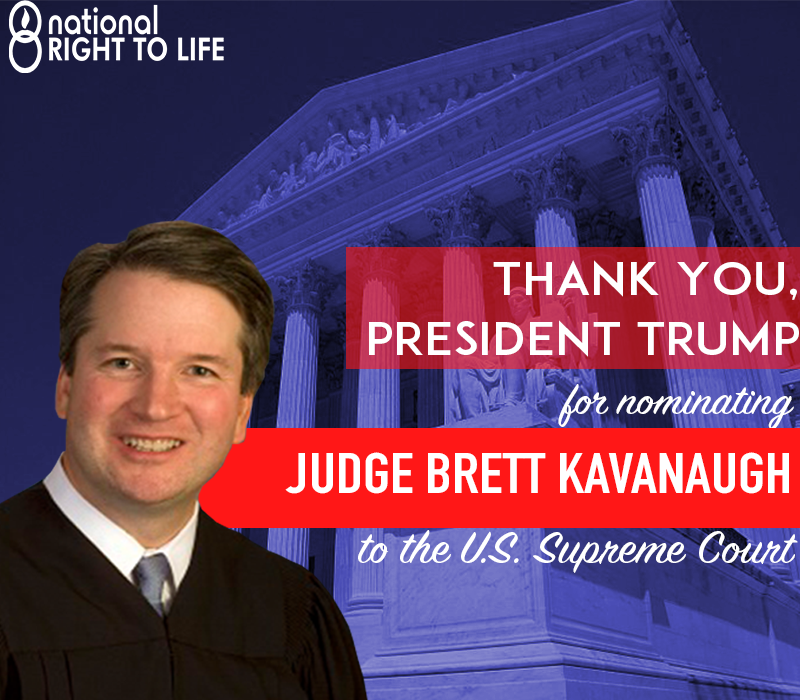 President Trump’s Pick Judge Brett Kavanaugh Needs Your Help! This is a game changer! Monday, President Trump nominated Judge Brett Kavanaugh to replace retiring Supreme Court Justice Anthony Kennedy. The pro-abortionists and the far-left wing have already announced they will spend millions of dollars to fight to block Judge Kavanaugh’s confirmation. In the history of the right-to-life movement, there has never been a more important time for us to come together and stand united. Nothing is more crucial to the success of our efforts to protect mothers and their children. Which is why we need you now more than ever. A very close vote is expected in the Senate – it is entirely possible that the nomination will succeed or fail by a single vote. The National Right to Life staff in Washington have already laid the groundwork to mobilize grassroots citizens in key states to contact their senators and urge them to support Judge Kavanaugh. But to carry out these plans, we need to quickly secure $500,000 now and another $500,000 in the coming weeks. Please consider helping our efforts now with a sacrificial emergency contribution of $500 or $250. Even $100 or $50 would help us secure the necessary funding we need to successfully confirm Judge Kavanaugh. Thank you for all you continue to do to help His most defenseless children. P.S. The timing is critical if we are going to succeed. I pray you can help us by making an emergency gift as soon as you read this.